You can use multiple result slides in a Storyline 360 course and even combine them for a composite score. In this tutorial, we'll look at adding result slides and configuring their properties. Tip: The responsive mobile player will always use the time remaining format. If you’re using a Content Library 360 result slide template, some of the following features may have already been added for you, but you can modify them fit your course. 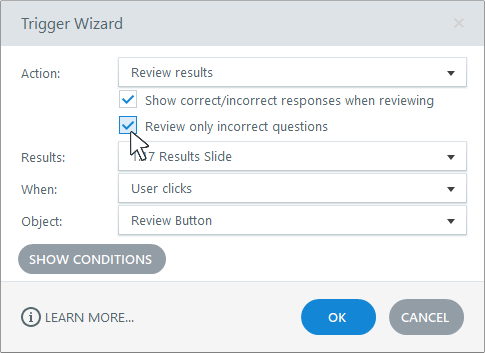 To give learners visual feedback on their performance, double-click the Review results trigger in the Triggers panel and mark the box to Show correct/incorrect responses when reviewing. To let learners review only the questions they got wrong, mark the box to Review only incorrect questions. 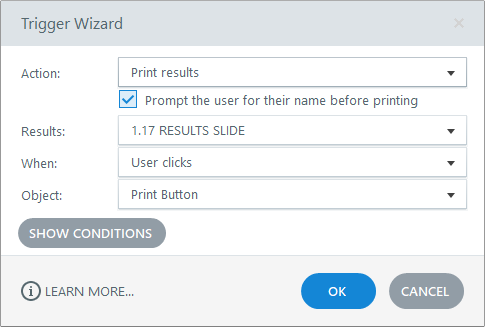 To include the learner's name on the printed report, double-click the Print results trigger in the Triggers panel and mark the box to Prompt the user for their name before printing. If the quiz drew a subset of questions from a question bank, learners will see a different subset of questions each time they retake the quiz. 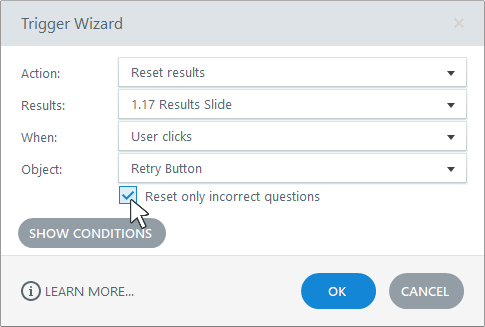 To let learners retry only the questions they got wrong, double-click the Reset results trigger in the Triggers panel and mark the box to Reset only incorrect questions.